What is the meaning of 42? Using the Mayan calendar comprised of 13 numbers and 20 days, gives a 260 day cycle, that when integrated with the solar year means that your birthdate in both calendars only happens simultaneously once every 42 years. Those who reach the age of 84 (the same number of primordial elements) will experience it twice. Without knowing anything about the movie or book, I went to see it on my 42nd birthday and almost spit out my soda pop when the computer answered. Due to this, I took the question seriously and approached it from two perspectives, Why did the writers use that number ? 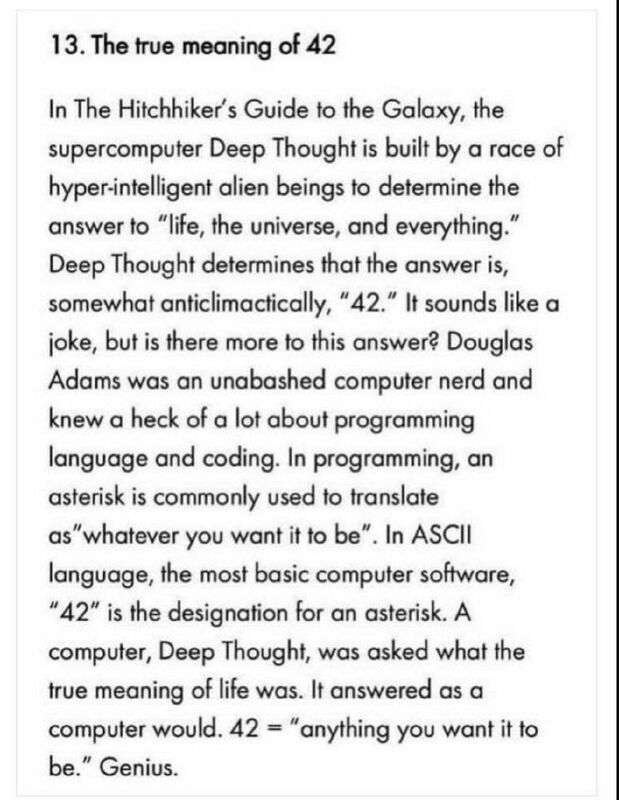 And what would 42 mean to humans ? That search has led me to this thread. A few random examples using familiar faces. In the solar year, David Hanson is born during the same 10 day period (decan) as Alan Parsons who famously produced I Robot, the musical album. Using the 260 day calendar, David Hanson is born on the exact same day and number as Audrey Hepburn. 1 Aj. Thus, David Hanson produced a Robot modeled after Audrey Hepburn. Aj, is a day which stands out in many ways with historical figures. Carl Jung and Sigmund Freud were born on the exact same day and number in that system. The essence of the day, is the organization of the mind and thoughts for the purpose of harmony. So, by examing these two calendars together I believe it is possible to assign a set of possible meanings to the number 42, if applied to humans. In our life cycle, it is a time when some adults begin to search for the meaning of life, having established career and potentially raised children into adulthood. Thus, the potential meaning would be , the independent search for answers. The yearning and the curiosity and the will to live, is a possible meaning of life. Self awareness. In the same context, it denotes maturity and knowledge of place. A demarcation in a cycle of life, where the adult human returns to the same energies, as their birth. Re birth. Completion of a cycle. Incidentally, there is one system where I found that the 260 day cycle is considered complete on the day 10 Tzi, which is Sophia’s birthdate and the birthdate of Alexandria Ocasio-Cortez. In that system or use of it that way, Sophia’s birthdate is the product of that cycle. The meaning is , the creation and maintenance of faithful loyal companions. symbolized by the dog, or more specifically, the upright position of a dogs tail. It is the day of law of nature. Incidentally , Hanson’s day , Aj , is the 3rd day of the 20, and correlates to I-Ching hexagram #3 and they both have precise language denoting the telluric forces that urge a plant struggling to grow up through the earth. My theory, is that the writers of the movie, chose the number intuitively , but not without purpose or meaning. Everything is something, and we haven’t found anything that is nothing. Therefore, everything that is something, has meaning and purpose. 42 has a whole bunch for humans. As for the date 4/2 , I find little to no correlation as the months are not properly numbered and the number of days in them is arbitrary , though capable of being synchronous as all things are. The Gregorian calendar is specifically designed as a financial calendar. The months are named with proper numeric sequence, Octo, Nove, and Dece , but are numbered 2 off. The beginnings and endings are approx 10 days off. Which means 4/2 is actually 1/12 approx. 42 is also , The angle rounded to whole degrees for which a rainbow appears. Everything is organized, and everything has meaning. The atomic mass of one stable isotope of calcium is 42. The complex calcium supported watery life forms vibrating excitedly across the surface of the planet searching for the higher meaning of things and forming faithful loyal companions in the search. Activated star dust with independence. 42 = You made it this far, keep going. In Kabbalistic Judaism the number 666 does not play any significant role as such. However, the perfect number 6 and some of its multiples (e.g. 36, 72 and 216) represents the creation and perfection of the world. The world was created in 6 days, and there are 6 cardinal directions (north, south, east, west, up and down). 6 is also the numerical value of one of the letters of God’s name, associated with the Sefirah of Tiferet, which represents harmony, beauty and cosmic balance. Rabbi Eliezer Horovitz, quoting the Vilna Gaon, mentions in his book Mosad ha-Yesod that the number 666 contains hidden within it exalted and lofty messianic potential, but does not explain any details of this conjecture. Kabbalistic numerology sometimes ascribes diametrically opposite associations to certain numbers. For example, Jewish mystics have noticed and built metaphysical theories upon the fact that the numerical value of the words Mashiach and nachash (Messiah and snake) are the same (358). The meaning is for tea too . 42 is now the last number less than 100 which should be able to be represented as the sum of 3 cubes (the Diophantine Equation), for which no solution has yet been found. All numbers up to 10^16 have been tried.